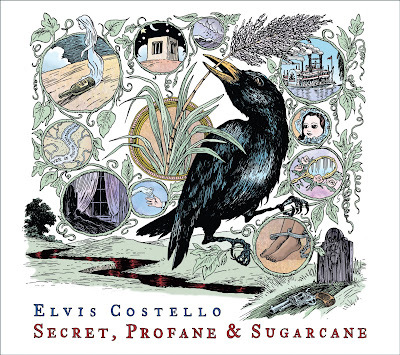 A couple of weeks ago, Elvis Costello released a new album, Secret, Profane & Suga rcane. I admit, this album wasn't on my radar. But, it's been getting quite a buzz and is now on said radar. The record marks Costello's highest chart debut in 30 years. Secret, Profane & Sugarcane was recorded in Nashville and produced by T Bone Burnett, who also co-wrote "Sulphur to Sugarcane" and "The Crooked Line" from the album. Also, on the record is a song Costello co-wrote with country music legend Ms. Loretta Lynn, titled "I Felt The Chill Before The Winter Came." This song marks Costello's second recorded songwriting collaboration with Lynn. After hearing the single, "Complicated Shadows," I think perhaps, that this is an album I should check out. Listen to "Complicated Shadows" HERE.